ON YOUR WEDDING DAY, NAIL CLOSED A BOX CONTAINING INDIVIDUAL - ProudMummy.com the Web's Community for Mums. 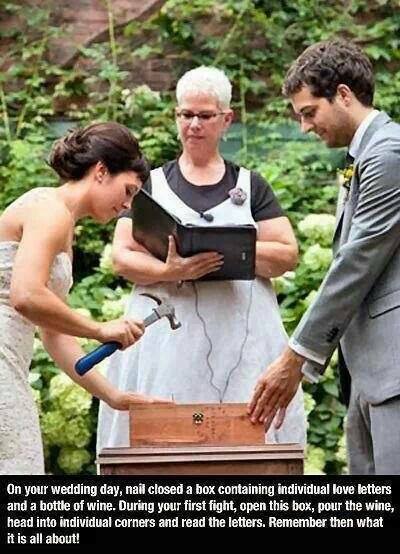 ON YOUR WEDDING DAY, NAIL CLOSED A BOX CONTAINING INDIVIDUAL LOVE LETTERS AND A BOTTLE OF WINE. DURING YOUR FIRST FIGHT, OPEN THIS BOX, POUR THE WINE, HEAD INTO INDIVIDUAL CORNERS AND READ THE LETTERS. REMEMBER THEN WHAT IT IS ALL ABOUT!